Your description says Median, however the example shows Average ? Did the method change ? LOL, John. Obviously you speak "numbers" better than I do--I didn't notice the discrepancy. But yes, I believe the method did change during the time I was on the board--I remember we discussed it--or rather, I listened to the automation team discuss it. Median is the current method--the language is on p.81 of this year's handbook. Thank you so much for the explanation. This has been a mystery to me for years. For example, how could we finish 2nd in Division D, but then drop to F for the next year? This makes sense to me now, but I do feel for those who used to have to do this massive swim off by hand! I have very much enjoyed reading the Blog this summer and I've learned alot about MCSL. I grew up swimming in Greensboro, NC, and although there are many differences in how the meets are organized, at the core summer swimming is about team spirit and fun. Great explanation, thanks and MCSL rocks. I do believe average may be more representative of a team than median does. Oh well, it is probably the law now either way should work fine. Our team moved up one division this year though we were tanked only 3rd in the division. Very interesting. Thanks, Whitney! Glad you enjoyed the blog--and interesting comment about summer swimming. Anonymous 3:03pm--I think we went to median because--and I am probably getting this a bit wrong as I don't do numbers well!--it was closer to what we do at an actual meet. Timers don't average the three times, they circle the middle one. They only average when something went wrong and there are only two times. 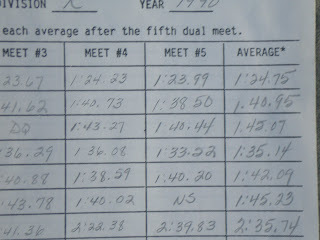 As a numbers geek and a former MCSL swimmer (and parent to a current one) I can shed some light on the 'old' days. 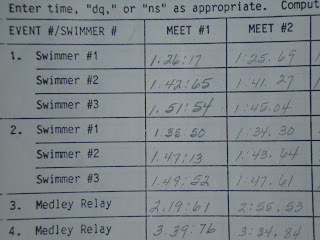 Yes, the divisions were determined by totalling up each teams total TW (Time in water) for all the team's swimmers in each event (A meets only). If anyone has a handbook from mid-80s or earlier you will see that it is listed as TW. 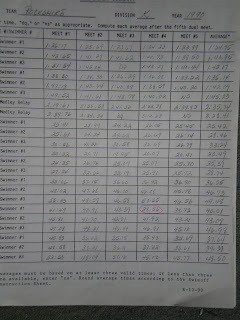 Then all the totals were put in ascending order and division assignments were determined fastest to slowest. This was the best (but not perfect) system available at the time but it was not necessarily an accurate indication of a team's ability. If a team had an elite swimmer in each age group but the remainder of thier teams was more middle of the road, they could find themselves in a higher division than they should be and consistently end up near the bottom of the division each and every season. With the advent of the computer, a better way (not best but definately better) became possible and that is the system being used today that is a reflection not just of a team's fastest swimmers but of thier overall depth which enables the division assignements to place teams that are on par with the other teams in the division. Now of course, it is not a perfect system so there can still be issues. BTW, thanks for this blog, it really helped me to remember my years of swimming. Thanks, Paul, for your wisdom on time in water. Glad you've enjoyed the blog!